Give your favorite Police Officer a Custom Printed Police Officer Coffee Mug to proudly display the city he protects day and night. Our Personalized Policeman Mug makes a unique Police Gift for Dad on Father's Day and an even better gift for your Uncle on his birthday. Our Personalized Police Officer Coffee Mug is Dishwasher safe and holds 11 oz. Includes FREE Personalization! 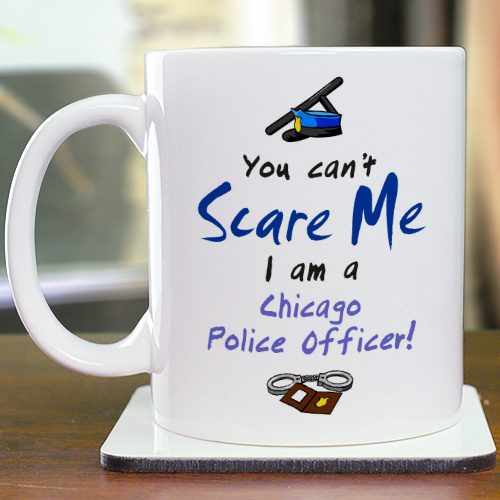 Personalize your Police Officer Coffee Mug with any city. Personalized Police Gift are perfect for Dad, Uncle or Grandpa on Father's Day, his birthday or even Christmas. GiftsForYouNow.com also has many additional Personalized Gifts for your special gift giving needs.